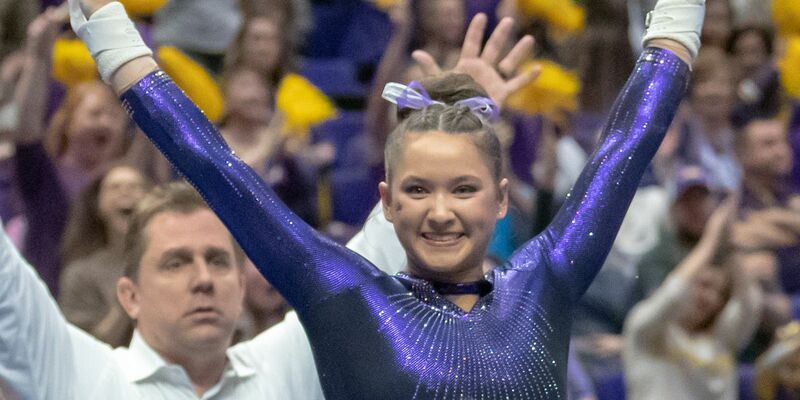 BATON ROUGE, LA (WAFB) - LSU senior gymnast Sarah Finnegan has been named a finalist for the 2019 AAI Award. Finnegan is an NCAA champion, 15-time All-American, All-SEC performer and is the reigning SEC Gymnast of the Year. There are currently six finalist for the AAI Award, this award goes to the most outstanding senior gymnast in the country. Finnegan is joined by Alicia Boren of Florida, Brenna Dowell of Oklahoma, Olivia Karas of Michigan, Katelyn Ohashi of UCLA and Toni-Ann Williams of Cal. The AAI Award is considered the Heisman Trophy of NCAA Gymnastics. The last LSU gymnasts to win this prestigious title was Ashleigh Gnat and Susan Jackson. Finnegan also holds back-to-back SEC championships and highest finishes in school history at NCAA Championships. The LSU gymnasts success is well rounded being a student-athlete as leader in the classroom, community and in competition. When Finnegan was only a sophomore, she became the first gymnast in school history to win an uneven bars NCAA championship. To end the 2018 season she was ranked the No. 1 bars performer in the country and anchored the Tigers’ lineup that finished first in the nation. In 2019, Finnegan has been the standout gymnast in the SEC and in the nation. Sarah has competed in the all-around in every single meet this season and has won 11 of 12 all-around titles. She is currently a six-time SEC Gymnast of the Week this season, and has tied April Burkholder for the most beam titles in career with 24. With 38 title wins this season, Finnegan could also break the single-season set by Susan Jackson and Sandra Smith with 45. The LSU senior currently owns career highs of 9.95 on vault, 10.0 on bars, beam and floor; and 39.800 in the all-around. Finnegan is the only ninth gymnast in the school history to score a 9.95 or higher on all four events. She is currently one of four gymnasts in the country to achieve the feat in 2019. Coaches from all around the country will vote for the winner of the AAI Award. The winner will be announced prior to NCAA Championships in Fort Worth, Texas, on Wednesday, April, 17. For additional information on Sarah Finnegan and the AII Award click here.